In communities where CAFOD works, many are suffering from more frequent and extreme floods, storms, or droughts, pushing the most vulnerable people further into poverty. Farmers struggle with more unpredictable seasons, with crops failing and livestock dying from a lack of food and water. Out of love for our sisters and brothers worldwide, we at CAFOD are called to respond and have been doing so through our past campaigns. Every child has the power in them to achieve great things. But with one in six people still living without electricity, the hopes of millions of the world’s children are too often a distant dream. Local, renewable energy is usually the cheapest, fastest and most efficient solution to bring power to the poorest communities. It can help families to lift themselves out of poverty, without harming the world we share. More than 30,000 of you signed our Power to be petition, calling on the World Bank to ensure renewable energy access for the world's poorest people. Thousands of parishioners urged the World Bank to stop funding polluting fossil fuels. 100 schools in England and Wales also got involved. Children drew their version of Sun Power and wrote powerful messages to the World Bank. Before Power to be launched, more than 3,700 of you signed a petition, emailed or tweeted Nick Hurd MP – who was International Development Minister until the 2016 government reshuffle – to ask him to help the one-in-five people around the world who lack the electricity necessary to light homes, cook safely, and set up businesses. Over the next 20 years up to 200 million more people could be at risk of hunger if we don't take further steps to address the causes of climate change. The Intergovernmental Panel on Climate Change (the lead authority on climate change science) says with 95% certainty that human activity is the main cause of climate change. Pollution from fossil fuels such as coal, oil and gas make a huge contribution to climate change. participating in important conversations on climate change through Show the love and Speak Up Week. 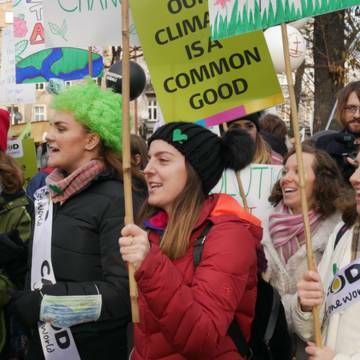 We also campaign on climate change and justice as part of Catholic networks CIDSE, Caritas International and the Global Catholic Climate Movement. Ready to join us in our latest climate campaign? Sign up for updates today.